I know very well that all of us (who live in overseas) just love to cook biryani. But we only cook pakki biryani. In pakki Biryani meat and rice are cooked separately then mix together and in kachchi biryani meat and rice are cooked together. As you know that kachchi biryani has more flavour (to me 10 times) than pakki biryani. 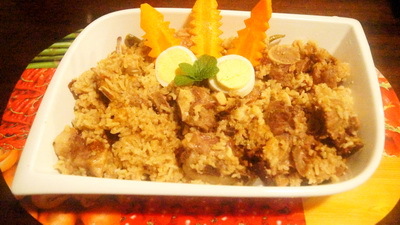 When I cooked my first kachchi biryani, I was sure that mutton would not cooked. But in reality mutton was cooked like cotton ball(Just loved it). So please please try kachchi biryani next time and share your opinion. In kachchi biryani meat size is supposed to be 2 -3 times larger than curry cut meat. If you can’t get large cut, use normal one. 1. Wash the meat and add all spices (except clove, green chiilies and bay leaves). Let it marinate for ½ hour. 2. Fry the onion till it becomes golden brown and remove oil. Keep aside the fried onion. 3. Heat 5 cups water. When water boils, add rice, bay leaves, clove and 1 teaspoon salt and cook it till it comes to first boil. 4. Remove from heat and drain it. Keep the water. 5. Take a heavy bottomed sauce pan and add marinated mutton, fried onion, oil,whole green chillies, salt and water from rice( as much to cover mutton ). Spread rice and clarified butter over the mutton. 6. Make dough from flour and seal the pan with flour dough. 7. Cook it 10 minutes on high heat and 50 minutes on low heat. 8. After 10 minutes open the lid carefully and add rose water. 9. Serve kachchi biryani hot with your favourite salad. 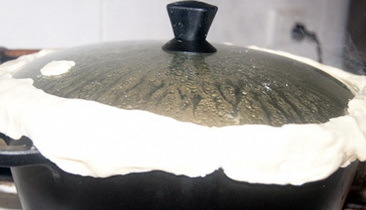 How necessary is the step to seal the lid with dough? Like, what would happen if you didn’t do that? Thanks! Do you think it would be OK just to use store-bought pre-made biscuit dough for this step? Most welcome .Very happy to hear your cham cham comes out good. I am working woman too. so I can understand your situation. Hope you will try my biryani and share your experience..
WoW! Amazing..I can smell your Birayni from here! thanku somuch Rowank apu for ur great recipes. I’m cooking it now for Iftar! I treated the whole act as Chemistry lab.. Your procedure is well defined and hope it turns out good… Thanks! Dear Rownak jahan,In your kachchi Biriyani recipe i find that you used half clarified butter and half oil,can you tell why this?i also see that you have not used any khoya or milk product to enrich the biriyani as traditionally done by the local deshi cooks in catering party.You have not used any raisins or nuts, alu bokhara and ghee, please clarify. I cooked in a Pressure Cooker 🙂 (at Low Heat) instead of sealing by dough (Flour is pretty expensive in Canada). It worked almost similar and I had to control the Steam valve. The only thing I figured out as a problem, layering. Some portion of Rice wasn’t cooked well. So, I had to reheat in the rice Cooker before serving. BTW, that was my only effort to make Kachchi until now. If i use the full boiled rice with uncooked mutton and leave it together for steaming in saucepan, i gues the rice will b over cooked.is it? But you mentioned in the recepi that ‘cook the rice till it boils.plz, clear it.i m confused. 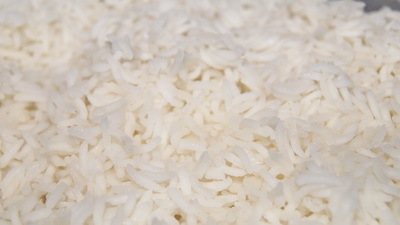 when water comes into first boil, take off from heat and strain the rice.rice needs to be less than half cooked. hope it is clear now .Thanks. If you want to stimulate some of the smokey flavor that you can get in the Bangladeshi Wood fires. You can put a hot piece of coal in a small metal bowl and put it on top of the rice and pour a few drop of ghee on the hot coal. Thanks for your helpful tips. Hi Rownak. Really appreciate the amount of effort you put behind setting this up. Just wanted to ask the following question – would using normal low fat yogurt do instead of the greek yogurt ? Apu tomar recipe ta oshadharon! Prothom bar ranna korlam eto risky ekta preparation but etto taste hoyechilo basar sobai khub obak hoye gesilo…onek thanks tomake…Allah jeno tomar mongol koren…tumi eto somoy niye eto sundor kore eigulo likhecho seta amader moton novice der jonne (jader rannar khuuub sokh) onek birat paoa. Allah er kache tomar jonne onek dua. Dhonnobad Shagutta Mahajabin. ami to nutunder jonno recipe likhchhi. tumi je sahos kore kachchi biryani ranna korechho tate ami khushi . ami jani koto sahos lage eta ranna korte. Thanks a lot for the wonderful recipe? Is it ok to use a pressure cooker? How does it make it different from the sealing with the dough? Thanks! sealing with the dough actually does pressure cooking and keep the aroma inside. if you use pressure cooker, aroma will come out. though you can use pressure cooking to compromising bit less aroma. Thanks.